Writing, mark making, line drawing, coloring, painting, cutting, and gluing have never been really enjoyable for my son. That’s ok because we have been working on his emerging pencil grasp with lots of other types of activities. I am pleased to say that when I do watch him use his pencil or draw pictures these days, he has an awesome tripod grasp. I owe a lot of the credit to his teachers at school, but I also like to think that I sent him off to kindergarten with strong little hands and great finger dexterity because of all our play with fine motor science activities. From making things erupt to launching erasers to making ice melt, we practiced fine motor skills on a daily basis through our play activities. No worksheets required. 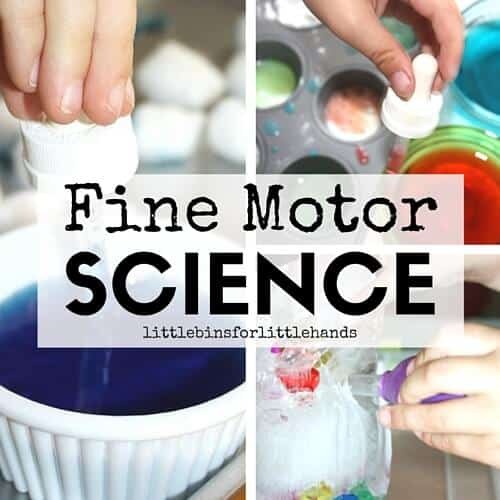 I paired his love of fun science experiments and need for fine motor skills practice into easy fine motor science activities I could set up quickly at home. He’s an old pro with an eye dropper, tongs, and a squirt bottle. Have you seen our fine motor book? Click on photo to find ordering details. 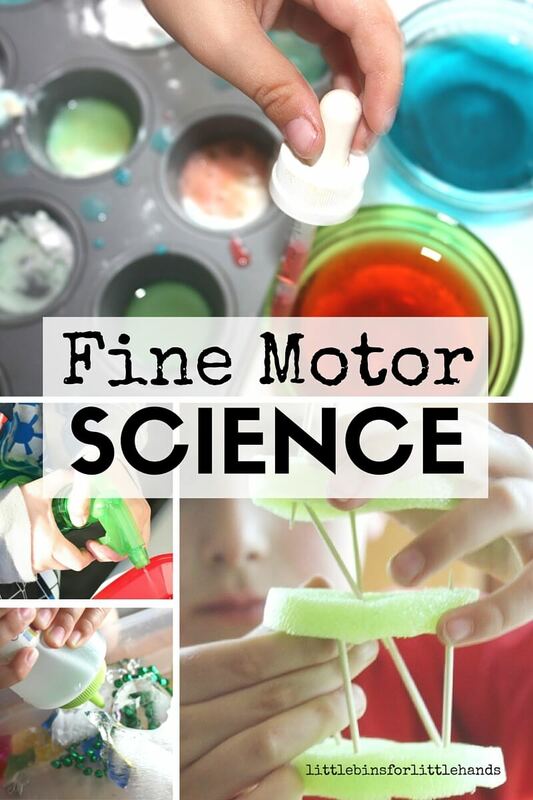 10 FAVORITE FINE MOTOR SCIENCE ACTIVITIES. Science requires a great deal of fine motor work, patience, and perseverance. Much like learning how to write and form letters with a pencil. Many of these skills can be worked on during these fine motor science activities that will later be used when learning handwriting. Take a look through all our best science experiments and you will see plenty of fine motor work. Click on links below to check out all the details for each science experiment. This is just a sampling of awesome fine motor science activities you can try with your kids both at home or at school. Simple supplies, simple tools, and simple fun, make learning and practicing fine motor skills a piece of cake even for the reluctant kid! I know because I have one! A thoughtful selection of fine motor activities every Friday!